Photos. Call Number: RG 0/24/P 1890s Prints: Campus: Panoramas (Photos). From left to right are Spooner Hall, Old Blake Hall, Old Fraser Hall (roughly where modern Fraser Hall is located), and Old Snow Hall. Also visible is Marvin Grove – the area of trees on the right side of the photo. 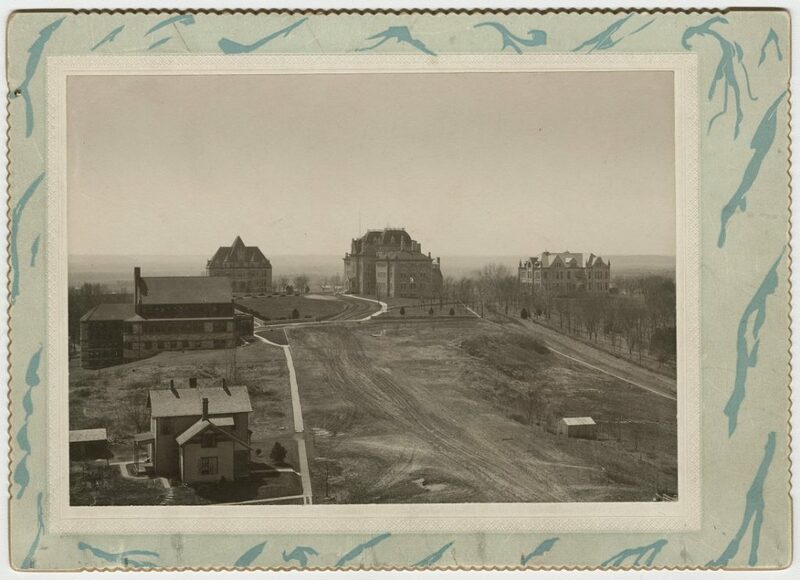 The empty area on the right is where Dyche Hall and the Kansas Union now stand. ‘Barteldes’ stands for quality and we spare no expense or labor to keep up this high standard of quality. 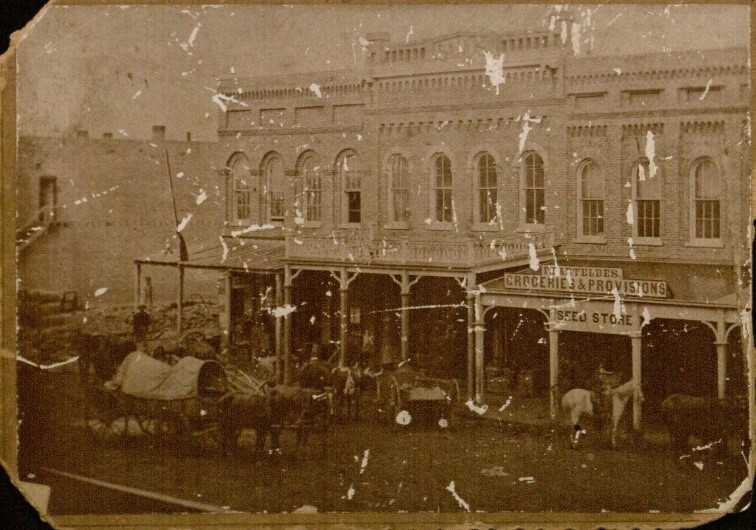 In 1860, six years after the first settlers arrived in Lawrence, Friedo Barteldes was the proprietor of a small grocery business on Massachusetts Street. He added a few seed packets to his inventory, and this aspect of his business grew rapidly. 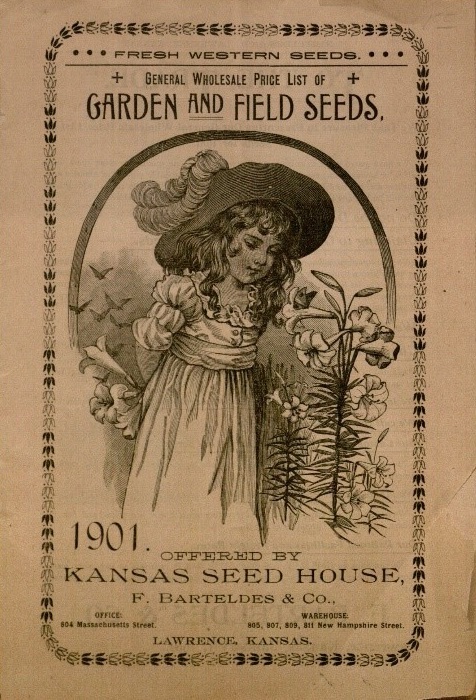 It became the Kansas Seed House, the largest seed firm west of the Mississippi. The business employed four salesman on the road, plus fifteen to twenty employees who worked at the House, cleaning and shipping seeds. Manuscript Collections. Call Number: Call Number: RH MS-P 1435. Click image to enlarge. Friedo’s nephew F. W. Barteldes joined the business in 1874. Upon Friedo’s death in 1887, F. W. Barteldes and Max Wilhelmi became the company’s proprietors. 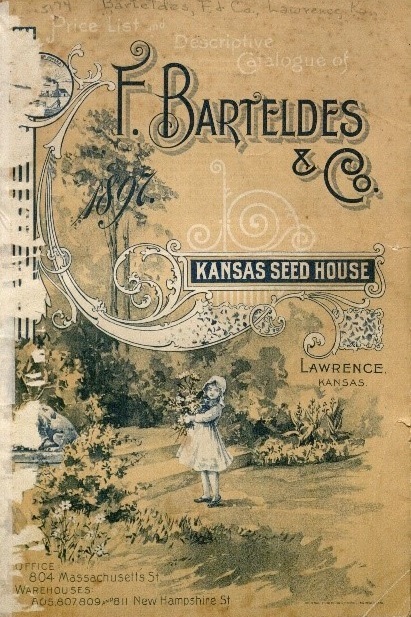 In 1906, the Kansas Seed House was incorporated as the Barteldes Seed Company. It expanded that same year, adding locations in Denver and Oklahoma City. The company’s headquarters moved to Denver in 1961.
that he filled once he returned to Lawrence. Call Number: RH C4970. Click images to enlarge. 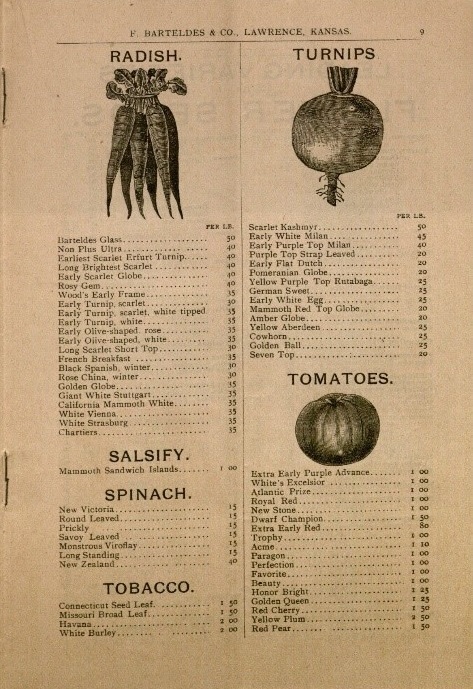 Pages from the Kansas Seed House catalog, 1901. Call Number: RH C4971. Click images to enlarge. 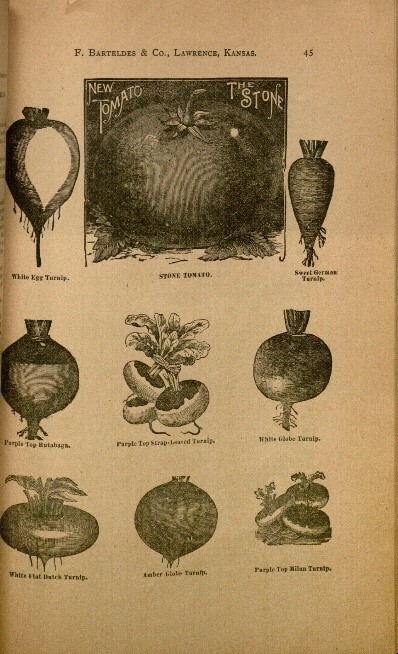 Pages from the Barteldes seed catalog, 1915. Call Number: RH Ser C1257. Click images to enlarge. 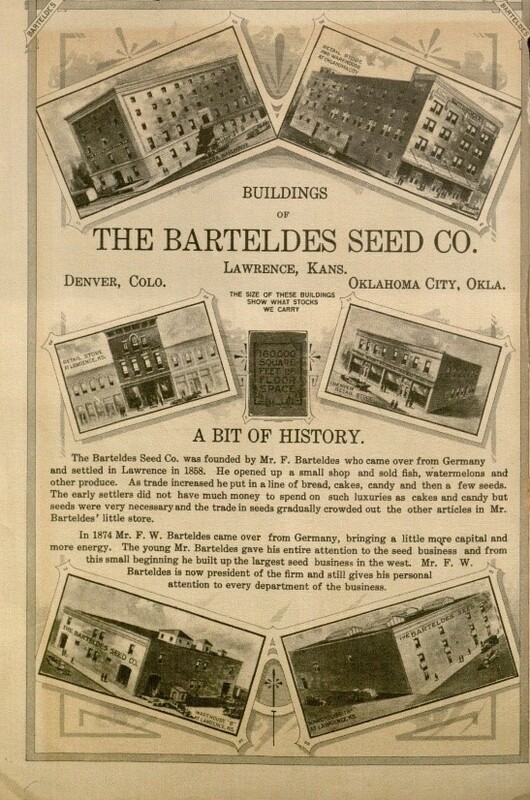 Barteldes Seed Company was located at 804 Massachusetts Street. Its warehouses – where seeds were stored and tested for germination – were located at 805-811 New Hampshire Street. The store was connected to the warehouses by a walkway over the alley. In 1999, the steel beam walkway was still visible. Today, 804 Massachusetts Street is occupied by Sunflower Bike Shop. 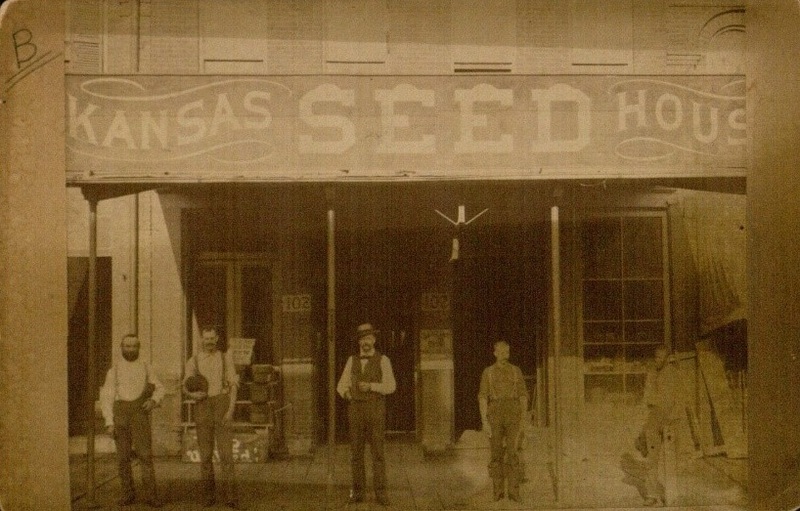 Kansas Seed House storefront at 804 Massachusetts Street, 1886. Owner F. W.
Collections. Call Number: Call Number: RH MS-P 1435. Click image to enlarge. Fire was a persistent concern for the Barteldes Seed Company. The first fire occurred in 1863 during Quantrill’s Raid. Friedo Barteldes was the first shop owner to rebuild and accounts state that the work was completed within seven days. Fire struck again in 1904, and the two-story building was rebuilt with a third floor. As a result of these incidents, the warehouses were reconstructed with fire safety in mind. Seeds were stored in steel cabinets with wire trays. All the doors and walls were fireproofed, and at least some of the ceiling and floors were glass. Each floor was equipped with a large fire hose, and each aisle had a fire extinguisher. 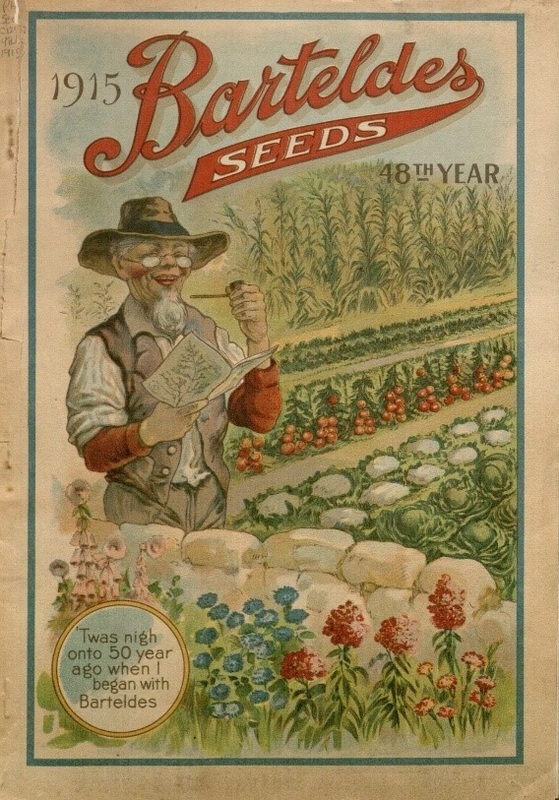 At times during the twentieth century, Barteldes sold more than seeds. In December, the basement of Warehouse A was used to store Christmas trees, and nearly all of the Christmas trees in Lawrence were from Barteldes. For many years, Barteldes also processed and marketed popcorn under their registered name TNT Food Products, Inc., which was formed in 1952. The first day of spring is less than one month away! Who’s ready for some warmer weather? 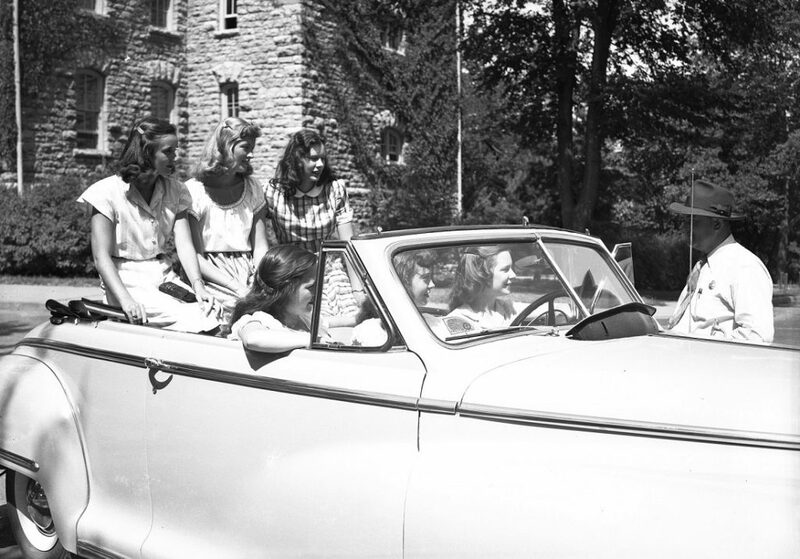 Women students in a car on Jayhawk Boulevard, 1940-1949. Bailey Hall is visible in the background. University Archives Photos. Call Number: RG 71/0 1940s Negatives: Student Activities (Photos). This month’s temporary exhibit in Spencer’s North Gallery – titled “Spencer Research Library and Archaeology” – features a collection of materials available through Spencer that could or have proven to be useful in archaeological research. Spanning from tomes written during the developmental days of archaeology as a science to modern articles on the forefront of archaeological investigations, the collections at Spencer Research Library offer a broad assemblage of knowledge not available through most library settings. The first display case demonstrates the spectrum of resources available to archaeological researchers by highlighting a sample from each of Spencer’s collections. This includes documents of early Old World archaeology, books on regional archaeology, archaeological reports, and serial clippings and publications featuring archaeological findings and collections. Such materials are often used as supplementary materials in extant studies, though there is plenty potential for new studies to be conducted as well. 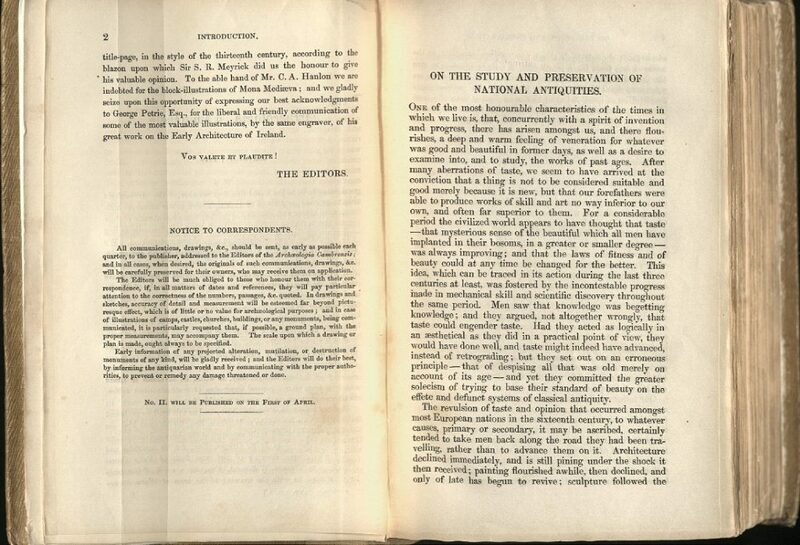 Archaeologia cambrensis (Welsh Archaeology), volume 1, number 1, January 1846.
in the development of archaeology as a science. Call Number: C16530. Click image to enlarge. strong background in archaeology. Call Number: RH C11685. Click image to enlarge. The second display case features materials available at Spencer Research Library that have been used in archaeological projects. One such project is the Douglas County Cellar Survey, known colloquially as the “Caves Project.” The Caves Project is a survey funded by the Douglas County Natural and Cultural Heritage Grant Program with the goal of locating and documenting stone arched cellars. The cellars (referred to as “caves”) – constructed from the 1850s into the 1920s – represent a cultural phenomenon unique to the region; thus, archaeologists hope to properly document these caves before they are lost to time. The Caves Project has utilized Spencer Research Library materials such as plat maps, deed records, and topical books on regional history. 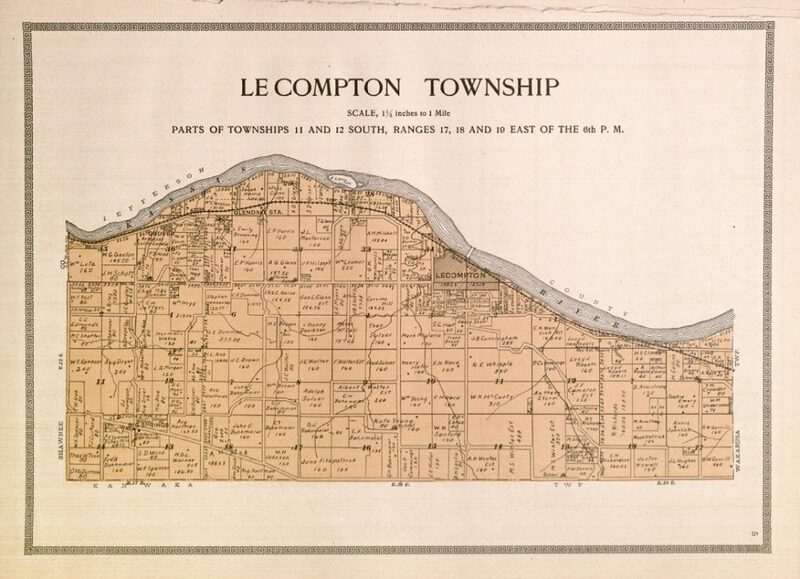 Plat map of Lecompton Township in Plat Work and Complete Survey of Douglas County, Kansas, 1909.
indicate images that were no longer extant. Call Number: RH Atlas G32. Click image to enlarge. Also included in the second display case is an artifact, known as a projectile point base, that comes from the Clovis Paleoamerican culture of North America. Likely a broken spear tip, this artifact is likely around 13,000 calendar years old. Found during a 1976 pedestrian survey of site 14DO137 near Clinton Lake in Douglas County, Kansas, this point base is one of the only remaining items left by some of – if not the – first people to ever walk in eastern Kansas. 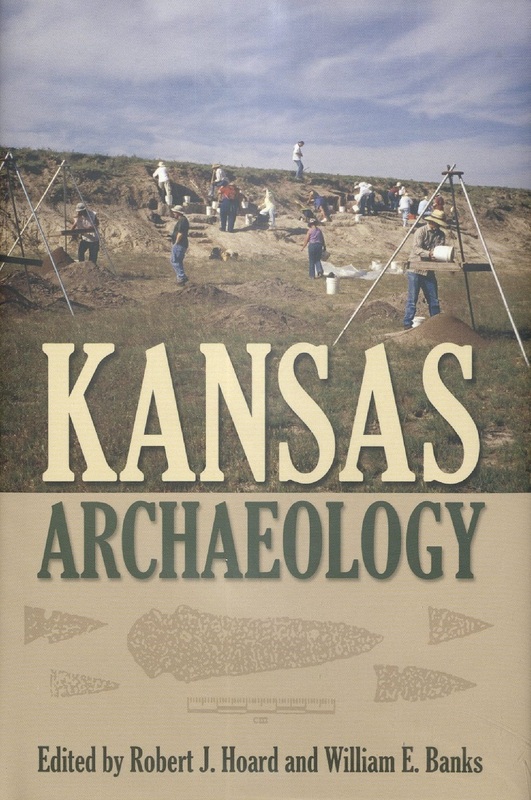 Reviewed as part of an ongoing survey of literature for the Caves Project, multiple archaeological reports indicated that the point was donated to the University of Kansas Archaeological Research Center. Thanks to their cooperation, the point has been loaned to Spencer Research Library for this current exhibit and, as seen below, three-dimensionally scanned. The point has been used in a number of archaeological investigations, including a report on the presence of Clovis people in southeastern Kansas by KU’s Dr. Jack Hofman. Your letter of 1/26 rec’d [received] yesterday evening. Cannot understand about our home-going mail. Some have not heard from the A.E.F. for three weeks. Possibly due to Christmas mail in States. Also received clippings about 35th Divn [Division]. Gov. 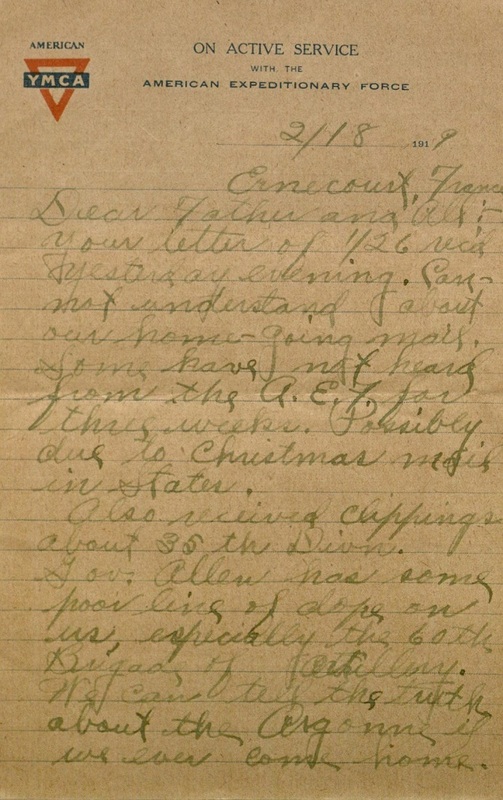 Allen has some poor line of dope [information] on us, especially the 60th Brigade of Artillery. We can tell the truth about the Argonne if we ever come home (1). Yes, I remember Gov. Allen, he “mootched a square [meal]” off the mess next day after we left the big push. Yesterday the 35th division passed in review before Gen. Pershing and Prince of Wales. To be sure Gen. complimented all the troops. He only wants a Presidental vote from us in 1920. But he will be S.O.L. Will close, promising to write before we leave for Russia. Last night I received one letter from you under date of 1/24, also one from W.E. Hankins (1), and Roy McClure (2). Roy’s address is Rumelange, Luxembourg. The clipping you enclosed about the return of the 35th and 89th divisions is quite true. Don’t think we will leave here until Mar. 15th now. Mrs. J.W. Reams (3) surely was getting very old and feeble. Fine old lady to be sure. The article about Ralph Randall is quite true, I can vouch for his statement, for I was Johnny on the spot. It was about 4 o’clock on the morning of Sept. 24th after our arrival late the night evening before. Ammution [ammunition] trucks had been bringing up high explosives all night and Jerry [Germans] had been sending us a few reminders of war all night, but about 4 A.M. he put over a real barrage, it was then I found partial safty from flying fragments in an old gun position. Had I staid out as Randall did I would no doubt of got mine. After the boy was shot up he was brought in this old gun position for 1st aid and it was there that I gave the Lt. Dr. and Red Cross boys one of my blankets to wrap him in. He was rushed to hospital soon, same as several others were that morning. It was early that night that I was sent to mud hole by one of the Hun’s [Germans’] big shells. Some concussion I witnessed. How is Genevieve getting along? Bet she is some girl now. Will close for now, only hoping you have received some of the many letters I have written since returning from Paris. Assuring you I am well and have any kind of a tonic here in this cafe necessary for perfect health and happiness. (1) Born in Missouri around 1870, W. E. Hankins was living in Sumner County by 1895. He was a longtime resident of Argonia. (2) Milo has mentioned Roy McClure in several previous letters. 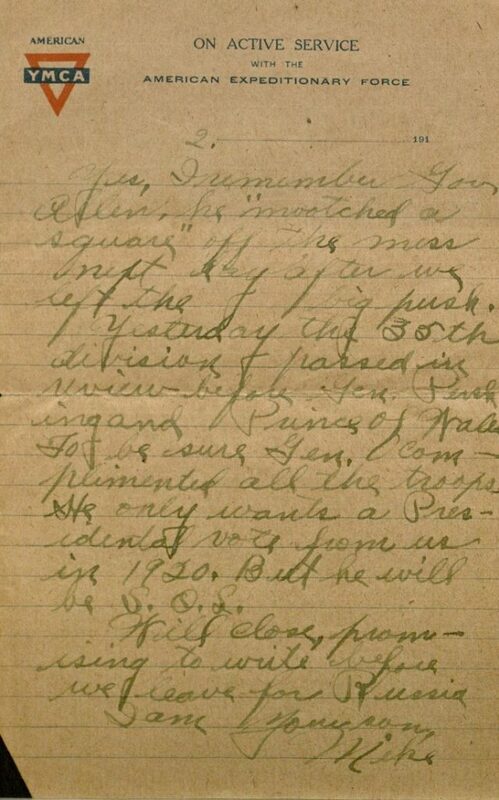 Biographical information about Roy can be found in the blog post featuring Milo’s letter of July 24, 1918.